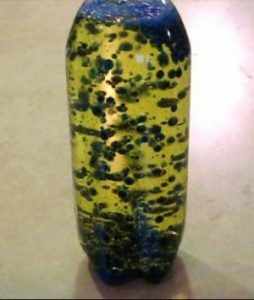 This project results in a non-toxic lava lamp that is safe for kids to make and use. Fill the bottle most of the way full with vegetable oil. Drip in a few drops of food coloring. Break an alka seltzer tablet into pieces and add them to the bottle. Seal the cap on the bottle. After the reaction is complete, you can break and add another alka seltzer tablet to make more bubbles. Feel free to shine a flashlight on the bubbles to add the ‘light’ part of a traditional lava lamp. I made a lava lamp video of this project so you can see what to expect.